In the very early days of The Traveling Spoon, I went on a virtual journey in search of my culinary ancestry. I told you of my love for Czech dumplings and my passion for German pastries - and I love these things, I really do, but one of the best things about traveling the world is that I've had the chance to taste all kinds of regional cuisines. I've eaten curried goat in Uganda, sampled schnitzel in Bavaria, and drunk the local wine in Spain. No matter where I go, I always find a new dish to love - and one of my Italian favorites is carbonara. I love a good carbonara. I mean really, really love it. So much so that it was one of the last meals I ate as a single girl, before Matt and I got married. The saltiness of the pancetta, the prickle of pepper in the mouth, and the velvety way the egg just barely clings to the pasta - perfection! Okay, so it may not win any beauty prizes, but just let your tastebuds be the judge! Since I don't typically eat a lot of pasta, I've always treated the dish as a rare treat - until now. By substituting spaghetti squash for the usual pasta, I've transformed the dish from a somewhat guilty pleasure into a meal fit for everyday. So often I find myself sharing new or unusual recipes on the blog and forgetting all about my old favorites. I'm working on changing that and this recipe is a good start - it's such a favorite that I've actually eaten it three times in the past couple of weeks! I'll be the first to admit that my version isn't very authentic - I don't add oil, butter, or parmesan, and I like to throw in some sautéed mushrooms for a bit of healthy flavor - but it is extraordinarily delicious and so, so easy. If you follow my simple, microwave method for cooking your squash, you can make this meal in under 20 minutes. Cook your squash beforehand (I usually cook both halves at once and just refrigerate the extra squash for up to 5 days) and you can have it on the table in 10 minutes. It really doesn't get much better than that! 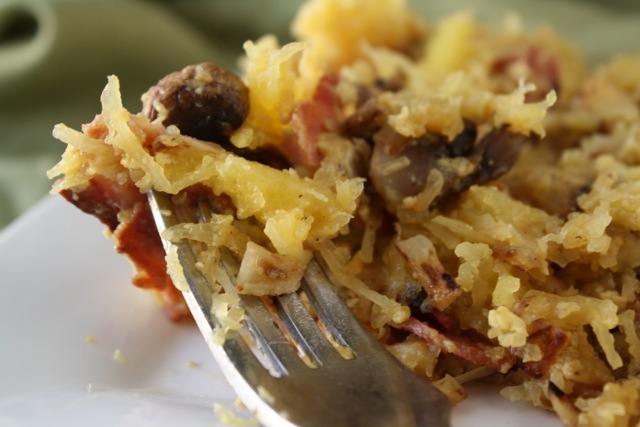 1/2 large spaghetti squash (about 3 cups), cooked - easy microwave cooking instructions here! In a medium frying pan, cook bacon until crisp. Remove to a plate and crumble when cooled. Meanwhile, cook the mushrooms and garlic in the same frying pan, using the fat from the bacon (you may wish to remove some of the fat before cooking if your bacon is very fatty). Sauté over medium heat until the garlic is golden and fragrant, and the mushrooms are lightly browned. Add the cooked spaghetti squash to the pan and cook until heated through. Remove the pan from the burner and stir in the beaten egg (it's important to stir the egg in immediately so that the heat from the spaghetti squash will cook the egg). Stir until the egg just becomes opaque and starts to stick to the spaghetti squash 'noodles'. Serve hot with a light dusting of parmesan cheese. A few notes: For a regular version, just sub in whole wheat pasta, cooked al dente, for the spaghetti squash. On a low-carb note, I've also made this with shirataki noodles and it's excellent. This really is a gorgeous little gem of a recipe! This looks yummy! And as a college student with very little time, I LOVE how little time it takes to make! 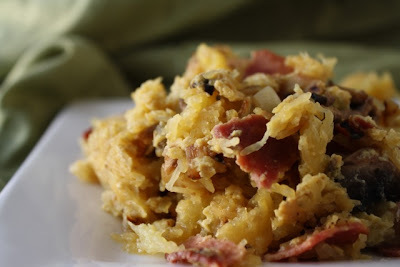 I was just thinking about spaghetti carbonara yesterday... and I happen to have all the ingredients on hand right now, including the spaghetti squash - definitely have to give this one a try. Sounds fantastic! I'm not overly-keen on pasta, so I think I'd prefer this recipe. It's healthy, too, which is great! I feel the same way! Sometimes pasta just feels so heavy. This dish is light and summery and has juts a fraction of the calories. Plus you can be happy knowing that you're filling up on mostly veggies! I'm glad you did, too! Thanks for visiting, Megan! I would love for you to share this with my "Unveil Your Genius" Link Party. This sounds really intriguing Rachel!! I love new menu ideas. Thanks for sharing at oopsey daisy! This looks delicious and something I could totally get my two year old to eat. Thanks so much for sharing at Whimsy Wednesdays! I hope you'll stop back over this week to show off your latest projects. I am so excited you linked this up! I have 4 spag squashes sitting in my garage from my winter farm share and I was looking for something new to do with them! Perfect! They're also really good with a bit of pesto. At first I pretty much stuck to classic red sauce, but now I'm using them anywhere I'd use regular pasta - I haven't had a disappointment yet! I have always loved squash. This sounds terrific. 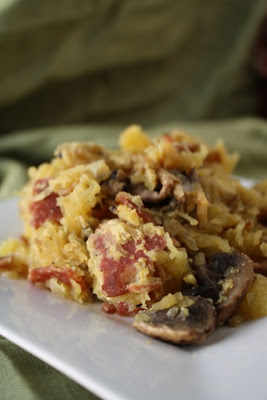 I really enjoy spaghetti squash but have never made it. Thanks so much for this recipe, and for sharing it too at Scrumptious Sunday! I love how healthy this recipe is...please share it on my foodie friday linky today.